Combine 4 cups of water, miso paste and ginger in a medium sized saucepan. Add whole salmon filets, cover with lid and poach gently over a low heat for 5 – 8 minutes. Don’t bring to boil. At this point, add broccoli, asparagus, mushrooms and shallots and continue to cook covered over a low heat for another 4 – 5 minutes until vegetables soften slightly. Divide rice between 2 bowls. 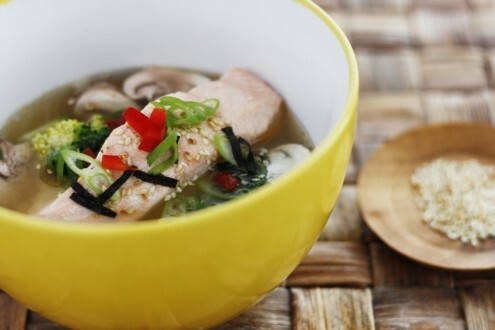 Place salmon on top and ladle over soup and vegetables. Drizzle with sesame oil and tamari and sprinkle with toasted sesame seeds and nori paper. Variations: Just before serving, add ¼ red capsicum finely chopped for a burst of crunch and colour. This looks delicious. I am always looking for new ways to cook fish because I know how healthy it is …..but I feel like I often revert to chicken or lamb just out habit. Great to have a yummy new winter option! I don’t have GDM but being in my early 30s I am much more conscious of eating well and it’s great having quick but tasty recipes that you can cook at the end of a busy workday. This is a great site! Hi Alice, I wouldn’t think so. The dried version has a few other seasonings in it which make it great for soup but here, you really just want the paste which is mostly just soy bean paste. Alice, sorry but I was thinking another recipe when I read this. I think that sachet miso would definitely work here. And I’m all for using what you have in the cupboard! My husband and I made this for dinner on Saturday night. Wow! It was lovely. We’ll be making this again, for sure! I’m 26 weeks pregnant and was told I might have gestation sky diabetes and was very sad and started to research on recipes and soooo glad I came across this recipe. I love everything about it. Its delicious filling and me and my husband enjoyed it very much.